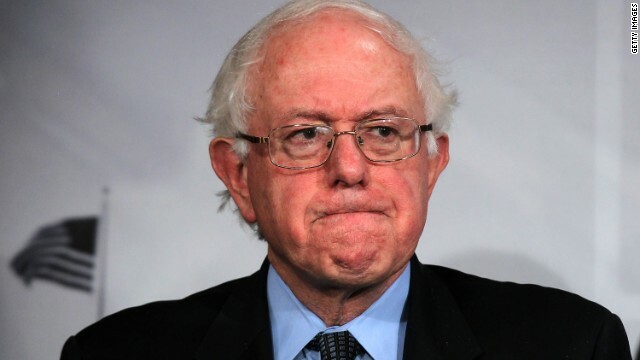 (CNN) - Sen. Bernie Sanders of Vermont, an independent who caucuses with Democrats, had some biting criticism for President Barack Obama's debate performance, saying Thursday that the president took a "disastrous" approach in his match-up against Mitt Romney. Asked to describe the president's demeanor on stage, Sanders said Obama did "poorly." "No question about it," Sanders said in his interview on CNN's "The Situation Room." "I think he was listless." A CNN/ORC International Poll released shortly after the debate Wednesday night showed Romney overwhelmingly defeated the sitting president. Sixty-seven percent of viewers said the GOP nominee was the winner, with 25% saying Obama fared better. Observers noted the president's tendency to avoid eye contact and his seeming lethargic, while Romney appeared to have more energy and looked at the president while speaking. Sanders especially took issue with the president's strategy to reference positions the two candidates have in common. Throughout the night, Obama said he and Romney both agree that the corporate tax rate is too high, that America needs a boost in energy production, that some regulations are needed in the marketplace - and that he suspects the two have a "somewhat similar" position on Social Security. The Vermont senator, however, said the president's decision to align himself with Romney - even if faintly - was a "disastrous approach." "The truth of the matter is, Mitt Romney right now is the head of a right-wing extremist party called the Republican Party," he said. "And if the president cannot differentiate himself clearly from right-wing extremism, we have a lot of problems as a nation and he has a lot of problems as a candidate running for re-election." The senator added that while Obama may have lost on style points, Romney lost on the merit of his policies. "From a policy point of view and honesty point of view, Romney was a failure, as well," Sanders told CNN's Wolf Blitzer and Kate Bolduan. Sanders was one of several left-leaning voices that offered disapproval of the president Thursday. Responding to the criticism, Obama's campaign has maintained their candidate did well and proved far more honest than his opponent. "Obviously, Mitt Romney had a good performance, but that's just what it was - it was a performance," Obama deputy campaign manager Stephanie Cutter said on CNN's "Erin Burnett OutFront." "He wasn't leveling with the America people or being honest with them about his own policies." Cutter continued, "Now that we know what we're dealing with in the Mitt Romney that showed up last night - I'm presuming he's going to show up in the next debate, too - We'll hold him accountable for the things that he's saying." He was also pointless, clueless and pretty much worthless. Of course he was listless, shockingly so. The man was tired since he has a country to run, Mitt's not employed right now, so he has hours, and hours to sit around and think of zingers. Oh, by the way, I am doing better now than I was last year. I am fully retired, early, with a pension, so it's so good for me. President Obama rocks.! Either Obama didn't want to slam Romney or wasn't fully prepared. If it was the first, then he was being overly polite. If he wasn't fully prepared, then his campaign really needs to get a shake up. Maybe Mr Sanders can give the president some tips,hes been around politics for ages..Always ask your senior companions what's good in most everything ,they do gather wisdom with age and there's nothing wrong with asking for advise ,it never hurt did it!! Makes you a more rounded person also,I'd ask, he's definitly faught jackels like Romney in his years I bet!! A debate is like combat a good offensive is better than a great defense you know where they are at all time. Bless. Obama was in shock, not listless. Romney was lying with a serious face with words written for him. I was in shock too, but not surprised. Repubs will do anything to win, lie, cheat, steal, kill....whatever. what does it mean when some one says who will pay for tax cuts? Mr. Sanders tells it like it is. Just hope the President was listening. Romney has spent 6 years lying - and everyone knows a true debater cannot debate a liar. Everything out of Romney's mouth was the exact opposite of what he says on the stump. The same goes for Lyin Ryan. Both proven liars. If they can't win honestly, they should not be the winners. Your values may be different from mine. Don't worry Bernie. Obama's a winner and we can draw sport's analogies to make the point. A good baseball team could lose a game, win the next one and so on and then go on to the World Series and win the whole thing. Obama is going to win this championship. Americans are smart and they're not going to let Romney's lies, distortions, flip-flops, arrogance and peculiarites dissuade them. They know they have the real deal with the President and they'll re-elect him. Thank God. Next time get Clinton as his coach, not John Kerry. Obama needs to force Romney to explain his positions in more detail or as Ted Kennedy once said, "Romney has changed his mind so many times and seems to agree with me on so many issues, he'll probably vote for me." He needs to ask why he won't share his taxes. He appears to be hiding not only his taxes, but how he will pay for his tax cuts. It's like "believe me it won't hurt." He is full of lies and flip flops and Obama let him off the hook time and again. Also, those tax shelters and his "not paying his share". What a sad pathetic place to live a life, the USA. Its just as all say, obama excuses coming from every nook and cranie of why this arogant idiot has a bad debate, just fess up, the one who thinks he is better than all is just a waste and just as much an idiot as the rest of his godless party.